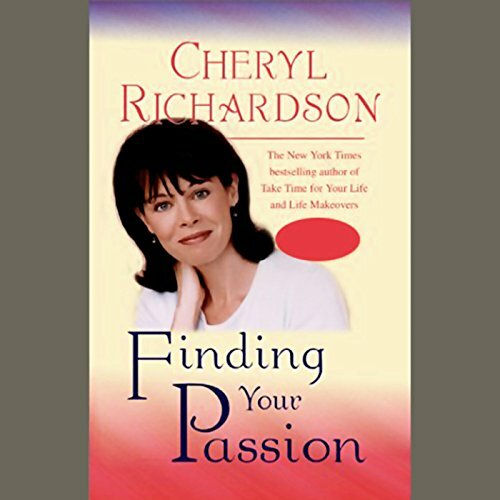 Life makeover coach Cheryl Richardson, who has been featured frequently on Oprah, brings her strategies for finding passion to this exciting and inspiring audio program. Using an upbeat yet down-to-earth approach, Cheryl stresses that passion is a strong response to any internal experience in life. Passion is not a reaction to an external event, so it should not be limited to career goals. After all, passionate interests come in all shapes and sizes. But how can you find your passion if you don't have the first clue about where to start? In this audio program, Cheryl gives hands-on exercises to help you reconnect with yourself, to help you find out what things get you excited. What books, movies, or people do you find yourself drawn to? What personal challenges have you overcome? What stimulates you? What drives you nuts? These questions will start you on the "passion path of development." Cheryl guides you along this path, from Stage 1 (self-care) to Stage 8 (action). She will definitely motivate you to live a life that's authentic for you. She will inspire you to face your fears, to be open to trying new things, and to take action when the universe opens a door of opportunity for you. Because, as Cheryl points out, the bottom line is that "the world needs what you have to offer. Don't rob us of that." Find your passion today! I've read this book (more than once! ).......I've listened to this book on audible........and each time I get something new out of it. I highly recommend it! My First Book fein cheryl, propably mit my Last :-) if you are stuck somewhere this Book will kick you in your a** to Start acting and stop complaining! Take Time for yourself - it's your life! Cheryl delivers, in a very conversational style, a way to help you discover what really trips your internal trigger. The twelve questions were most helpful for me personally. When you come to them, stop the program and write down your answers for each one. I have shared her questions with many others, and have referred this presentation to at least a dozen people since I first listened to it two weeks ago. After listening to it I am more focused than I've ever been before. I also joined a Life Makeover group locally and am looking forward to my first group meeting! I highly recommend this to anyone who may be questioning what it is they should do when they "grow up"! I listened to this book while driving. The only downside is that she runs through points which I could not write down due to driving. Great book.. I recommend for anyone who is experiencing any form of transition in life. I'm usually skeptical of books like this. Passion? Heh! <rolls eyes> I bought it because I like this author's other titles. To my surprise, this book is better than I could have hoped for. There isn't a formula to follow. It's a fun, light-hearted, and real approach. It didn't feel like doing self-help work. It feels more like a heart to heart talk with a good friend. The talk isn't about changing me to be someone I'm not. It's a celebration of who I am and a window opening to show me so many places I could go. I am impressed with this audio book, and I'm going to send it as a gift to several friends for their birthdays. Cheryl Richardson provides lively, down-to-earth insights into how to realize what we feel strongly about and what attracts our attention, i.e. our passions. She adds guidance as to how to develop a plan to engage our passions. Embedded in her presentation is simple wisdom about living more aware and more in the moment. Recorded with a live audience, one gets to hear how her words and presentation affects others. Also, through her anecdotes and the audience participation, we hear real life examples of what results can be achieved. Cheryl Richardson shows the listener how to get rid of all the crap in our lives that cause us to somehow ignore our passions and keep doing the same thing we've always doing. I have a greater appreciation of little things, like flowers, after reading this. Get it and you'll know what I mean. I bought this audio program because it was short, cheap, and about Finding passion, which is what I was looking for. Never heard of the speaker and didn't expect much. However, I was completely surprised by the quality of this audio program. First of all, she is a great speaker. She keeps the listener entertained, which is hard to find. I had my own ideas of creating passion and never thought about the many ways she mentions. This book definitely delivered what I was looking for. Definitely worth the money. The best line in this book I feel is the one about how the world needs you to contribute what you're passionate about. That's good. The rest will be dependent on where you are in life and what things you need to overcome to get there. This is a speech given to a live audience, so it is interesting to hear other's feedback. Primarily though, it's a "go get 'em" speech, and didn't find enough pragmatic structure to achieve passion. But then again, is there a practical, structural way to achieve passion, and if there was, what does that say about the passion? Would we really want it? If you're a fan of Cheryl Richardson's radio show you'll love this live seminar. Just like her show, she gives personal advice to audience members, helps brainstorm to get them out of their respective ruts, and offers concrete exercises to get over blocks or to get the creative juices flowing. Highly recommended! Liatened over and over! love it! Im trying to find a Life Makeover Hroup to join. This awesome book is for everyone. It is so empowering and inspiring. I think everyone can get something from it. I can’t wait to put in to action what I have discovered about myself.